For decades, the “Daily Police Bulletin” served as a vital tool in the fight against crime. Officers received one every day in roll call, and copies were sent out to local and regional police agencies. In the days before Twitter and text messages, this was how news of the latest crime happenings were spread through the LAPD. Presented here is a small but growing collection of old LAPD Daily Police Bulletins. When I can find it, I like to do some digging into the whole story regarding these little bits of history. If I’m able to dig up anything additional facts regarding the items on this page, I will update them with details. I found this one from July 20, 1927 on eBay. From the collection of Police Chief Michael Webb, 1950-2009. Webb joined the Vinita Park, Missouri police force in 1974 and served until his death in 2009, during which time he purchased crime artifacts from relatives of criminals and law officers. Boasting more than 8,000 wanted posters, pieces of Webb’s collections have been featured in film and displayed at the National Crime and Punishment Museum in Washington. April 18, 1927. Bank robber and former seattle police officer Paul Knapp is shot by police on direct orders from the Chief. Somehow I think the idea of “shoot first and talk later” wouldn’t fly today. In July, Knapp escaped. The circumstances of the escape were…interesting. 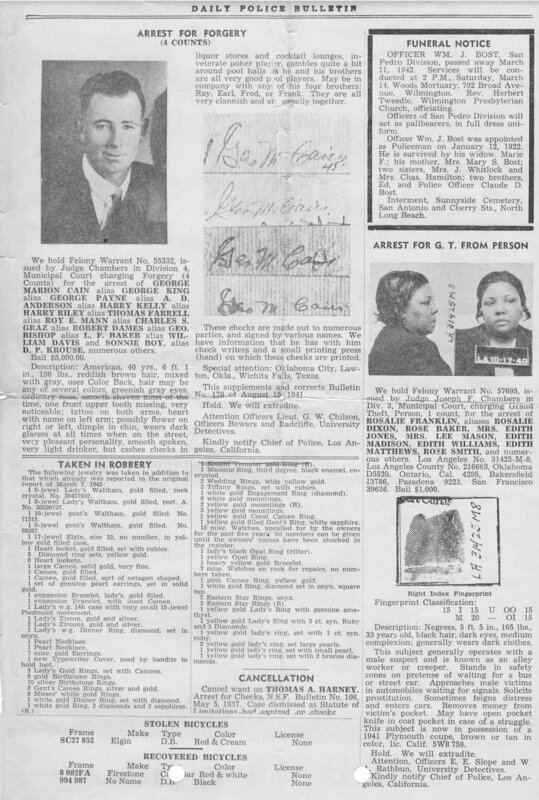 April 29, 1927: Knapp is identified as a suspect in attacks against women. Knapp was eventually recaptured and sentenced to 16 to life in Folsom. Above: Knapp’s mugshots when he arrived at Folsom in 1927, and then when he was transferred to San Quentin in 1943. It appears Knapp paroled once in 1944, was sent back, then paroled again in 1958. Daily Police Bulletin, June 17, 1938. I found the offering of a Gymnastics class pretty interesting.